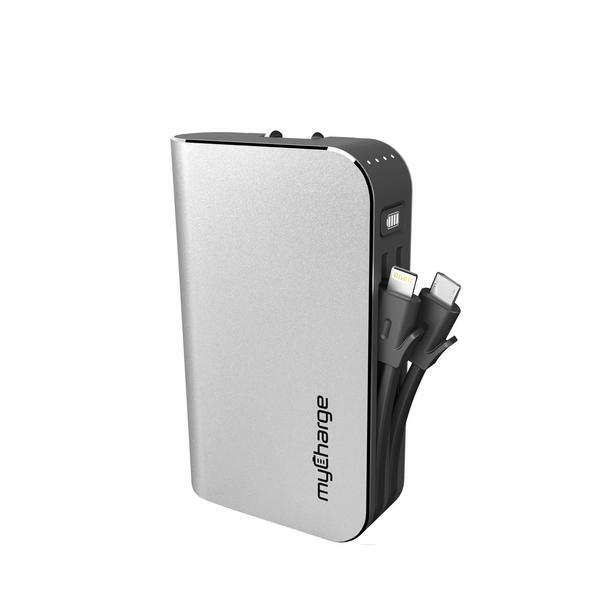 I am certainly no stranger to MyCharge products. In fact, I have reviewed three of them in the past two months. Now, I had a chance to review the HubPlus-C, and all I can say is: it’s about time. You see, I happen to have a phone with a USB C port, the HTC 10. I honestly believe that this gives me the power to charge my phone very fast. I’m not certain if I am getting ahead of myself, as I am describing something that I may or may not have properly introduced. Generally, I reviewed a lot of mobile batteries, and it is usually the standard shtick of charging them (generally via USB) just so you can charge a smartphone, tablet, or other mobile device later. The HubPlus-C is the first of its type that I have encountered with a built-in USB-C cord, and it also comes with a micro USB cable as well. There is also a USB port, in case you want to charge some other third thing. Also, this is a battery with prongs that flip out so you can charge the myCharge HubPlus-C with a typical wall outlet. So yes, the MyCharge HubPlus-C is a very convenient product to have. About the only thing left is to give the stats. It is good for 6700 mAh and an output of 18 W Max. About the only thing that I don’t have is the price. So far, I don’t see the product on the site, but I’ll see about getting a price and updating this blog with the proper link.